Esta maxi-camisa de inspiración masculina os la enseñé en este post a modo de vestido, click aquí y hoy me apetecía darle otro giro y llevarla atada con un nudo y con los vaqueros de ZARA. 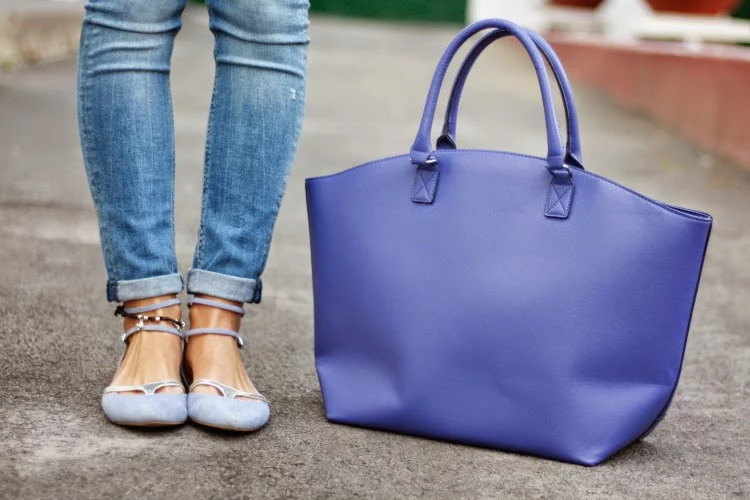 En esta ocasión elegí los complementos en color azul: bolso, zapatos y pulsera. Muchas gracias por vuestros comentarios y visitas, ¡feliz semana!. If something is abundant in my closet are jeans and basic shirts and blouses, I don't complicate because I always end wearing so easy outfits and adding the different touch with accessories or shoes. I show you the same shirt in this post as a dress, click here and today I wanted to give it another style and wear it with jeans from ZARA. This time I chose blue accessories: bag, shoes and bracelet. Thank you very much for your comments and views, happy week !.